Push Your Limits with This Survivor-Style Extreme Tour: Zip Line, Climb, & Canyon! 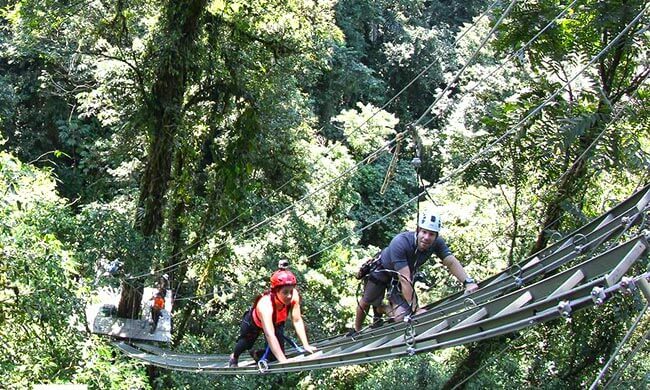 These extreme tours Costa Rica are an adrenaline junkie’s must! Sky Limit Adventure is the newest extreme attraction in the Arenal Sky Adventures theme park and can be done as a competition course. So grab your friends and family and fire up that competitive spirit! The first section is done on top of the trees with a canopy tour on twin zip lines, high ropes, a tree-to-tree ladder bridge, and a free fall jump! The second section is done in between canyons, Tibetan bridges, canyoning, rappelling, and Tarzan swing. This intense obstacle course will test your physical and emotional strength, so it’s not for the faint-hearted! Please not that Sky Limit is a high-intensity activity not recommended for people with any kind of health problems. Restrictions: Must be older than 15 years old; waist size 25-46 inches (65-117 cm); maximum weight: 242 lbs (110 kg); height: 4’11”-6’11” (150-210 cm). What’s included: Bilingual guide, all necessary equipment. What to bring: Hiking or tennis shoes, comfortable clothes, jacket or raincoat, sunscreen.